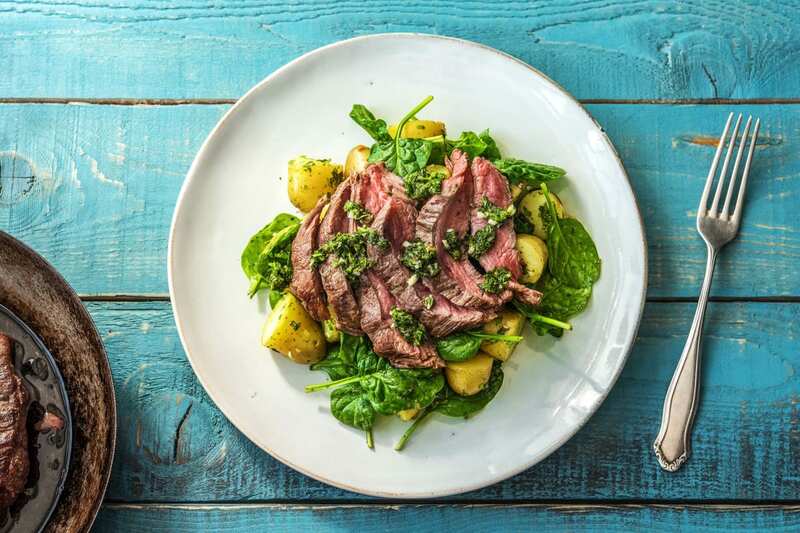 Put a Large Saucepan of water with a pinch of salt on to boil for the potatoes.Remove the flank steak from your fridge and rub with a light coating of olive oil.TIP: If possible, do this an hour before you start cooking so the steak can come to room temperature - this ensures more even cooking.Cut any larger new potatoes in half. 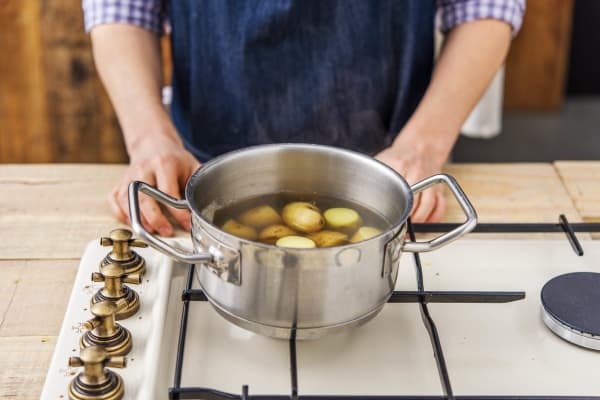 Add the potatoes to your pan of boiling water. Cook for 12-15 mins. TIP: The potatoes are cooked when you can easily slip a knife through. Drain in a colander and set aside. Peel and grate the garlic (or use a garlic press). TIP: The garlic is used raw in the dressing. If you prefer a less strong garlicky flavour, just soak the clove in boiling water for 2 mins before grating. 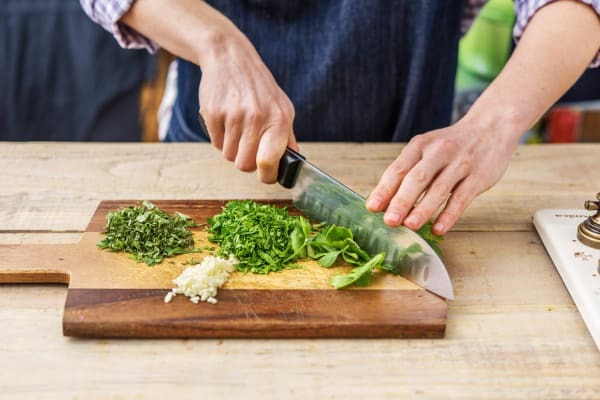 Pick the parsley and oregano leaves from their stalks and finely chop (discard the stalks). 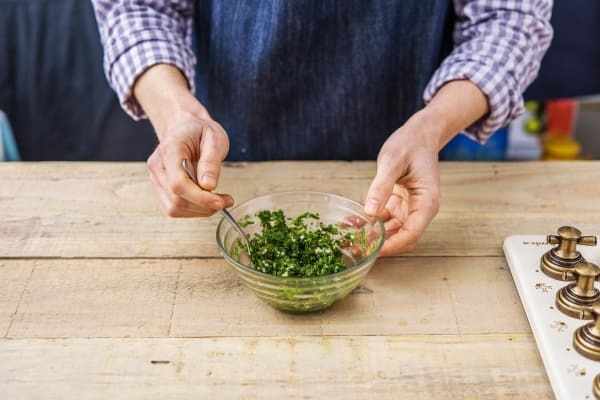 TIP: Grind the parsley and oregano in a pestle and mortar if you have one! Combine the garlic, parsley and oregano in a bowl with the chilli flakes and red wine vinegar. TIP: Some like it hot, but if you don't, just hold back on the chilli! Add a generous splash of olive oil and season with salt and black pepper. 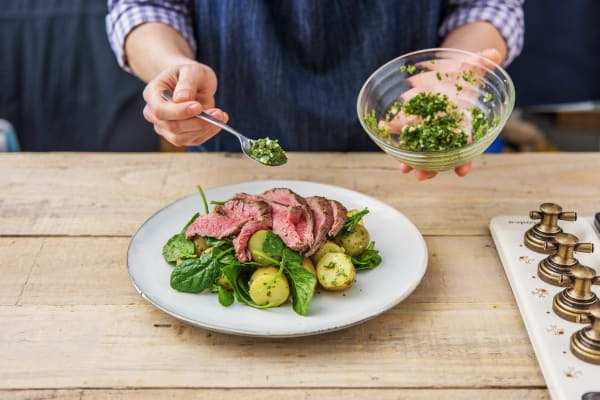 Whisk vigorously with a fork - this is your chimichurri dressing! Heat a large frying pan until it is VERY hot (be careful!). 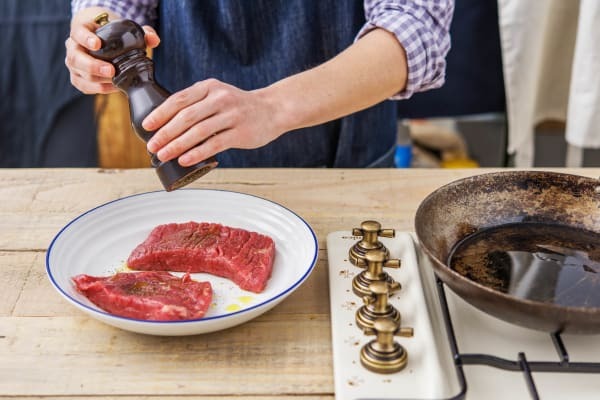 Season each side of the steak with a good pinch of salt and a few grinds of black pepper. Add a splash of olive oil to the pan and carefully lay in the steak. Sear on each side for 3-4 mins. TIP: This will give you a medium steak, but cook for a little less time if you like it rare or a little longer for well done. 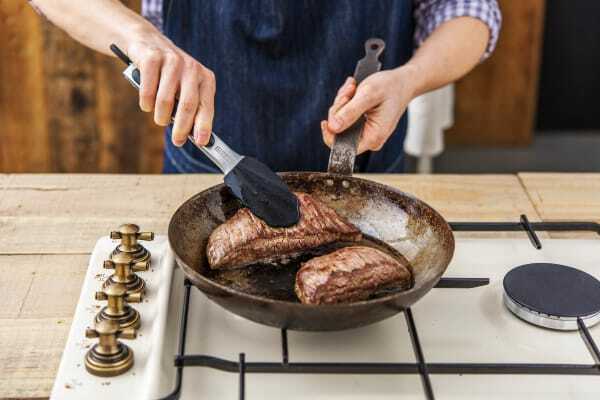 When cooked to your liking, remove the steak from the pan and set on a board to rest for another 3-4 mins. TIP: Resting time is crucial for a juicy steak! Put the drained potatoes in a mixing bowl and add the baby spinach. Dress with half of the chimichurri dressing. Slice each steak into diagonal strips, cutting across the grain of the meat. Serve on top of a generous portion of salad, drizzled with the remaining dressing. Tuck in!